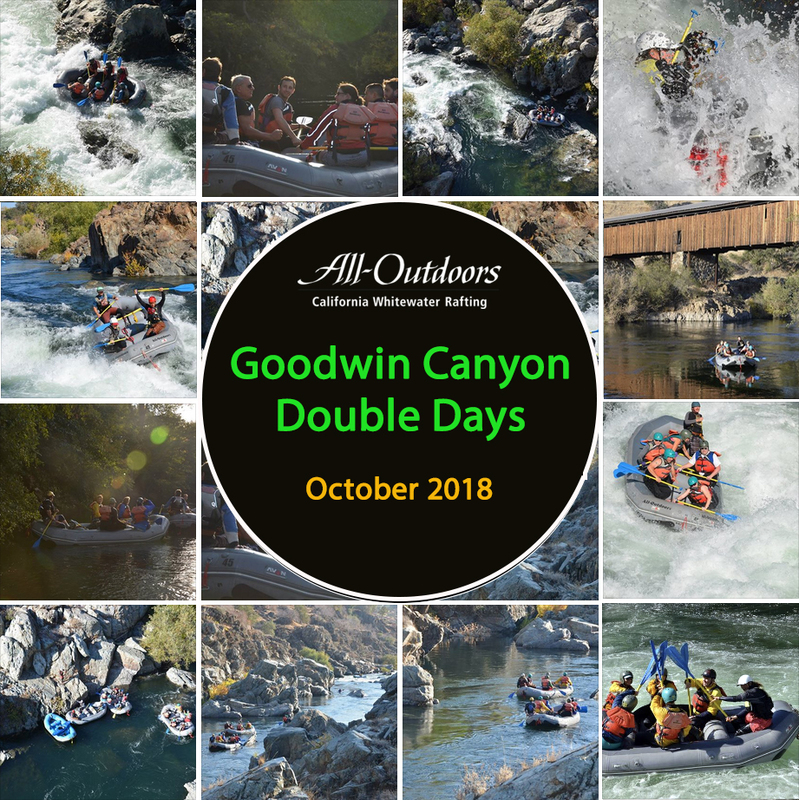 AO Blog > California Rivers: Flows, News, Events > Goodwin Canyon > Goodwin Canyon Double Days: Class IV+ Whitewater Rafting in October! Goodwin Canyon Double Days: Class IV+ Whitewater Rafting in October! Now Taking Reservations for Goodwin Canyon Double Days! We are now accepting reservations for this limited once a year event, so if you’ve been waiting for this announcement now is the time to reserve your space. For this special trip, we ask that you contact us directly to discuss the specifics of this trip before you book. You can call us at (800) 247-2387, use Live Chat, or email us anytime at rivers@aorafting.com. What is Goodwin Canyon Double Days? This is an annual series of rafting trips that occurs every fall on the Goodwin Canyon section of the Stanislaus River. We take advantage of special water releases that are conducted to help thousands of migrating Chinook Salmon find their way upstream to their spawning grounds. Making the most of the opportunity we run the river twice in one day (hence the name: Double Days)! In the morning, we drive to the top of the river, run the four miles of Class II, III and IV+ rapids, ending up at a well deserved barbecue lunch (Yum!) Then we get to drive back up to the top and do it all over again! Many of our guests comment how much fun it is to do a trip this way, because the first time goes by so fast you can barely remember what the rapids looked like. The second run gives you a chance to appreciate the scenery a bit more (and possibly gives you the opportunity to make up for that one rapid your crew didn’t quite get right the first time down). Read More About Goodwin Canyon (Intermediate – Advanced / Class IV+). Why October? Isn’t Rafting Really More of a Summer Activity? Not in California. Fall rafting is beautiful. The soft lighting coupled with the colors of changing leaves make October one of the prettiest months of the year for rafting. Water releases from upstream reservoirs that are used to generate power also provide recreational boating opportunities to the public. Goodwin Canyon’s seasonal weekend release is timed especially because of the late season Chinook Salmon Run, which means that we have a very good chance to see the spectacle of the massive spawn while we raft downstream. It’s just one more feature of this trip that makes it a very unusual and special experience.. The usual minimum age for this trip is 15 years old; the challenges here are not suitable for younger children. Space sells out quickly. We currently have plenty of room, but this annual event usually sells out in advance. We encourage you to talk to one of our office staff if you have any questions about this trip; our goal is provide an amazing experience close to home, but part of that is making sure you know what you are getting into. Where is Goodwin Canyon? Only 1.5 to 2-hour Road Trip From Anywhere in the San Francisco Bay Area! The closest whitewater rafting trip to the San Francisco Bay Area, this hidden gem of a river is only a 1.5 to 2-hour road trip, making this one of our most convenient rafting trips. Not many people even know that it exists. This is a well hidden secret canyon on the lower Stanislaus River; if you’ve ever made the drive past Oakdale on Highway 120 on the way to Yosemite National Park, you probably didn’t even notice it was there. But tucked away from sight among the golden rolling foothills is a steep-walled lush volcanic slot canyon featuring fun Class III rapids and two Class IV rapids, all within a short drive from your doorstep. Find more information about how to get to Goodwin Canyon. 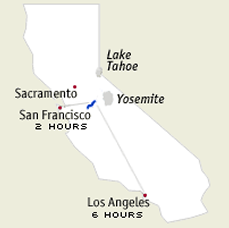 To make arrangements for this trip, please contact us to speak with an All-Outdoors California river specialist.